Monday we went to our first minor league baseball game here in Hampton Roads. 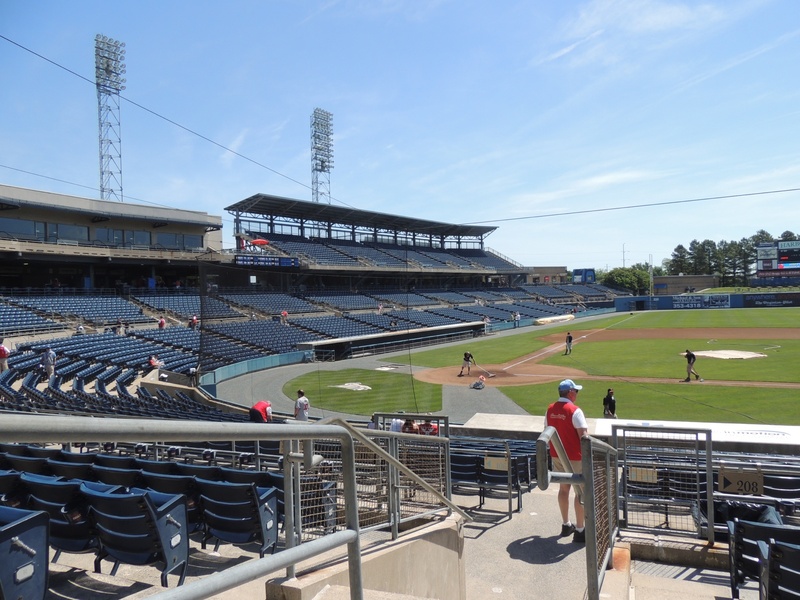 Our AAA team is the Norfolk Tides who play in a beautiful stadium called Harbor Park. We parked our car at the Park & Ride and took the light rail to the stadium. Getting there an hour early gave us time to get situated, buy our program to learn the players, and scope out the food vendors. The stadium is transformed once the crowd arrives and the players take their positions. Baseball is such an American sport that you just feel patriotic attending a game. We love the minors because they have a small-town, intimate feel about them. When we lived in San Antonio, we used to take our kids to see the Missions play at St. Mary’s University. The Missions didn’t have a stadium of their own at that time, though later, when one was built for them way out in the boonies, we attended once and never went back. It had lost the home town flavor. 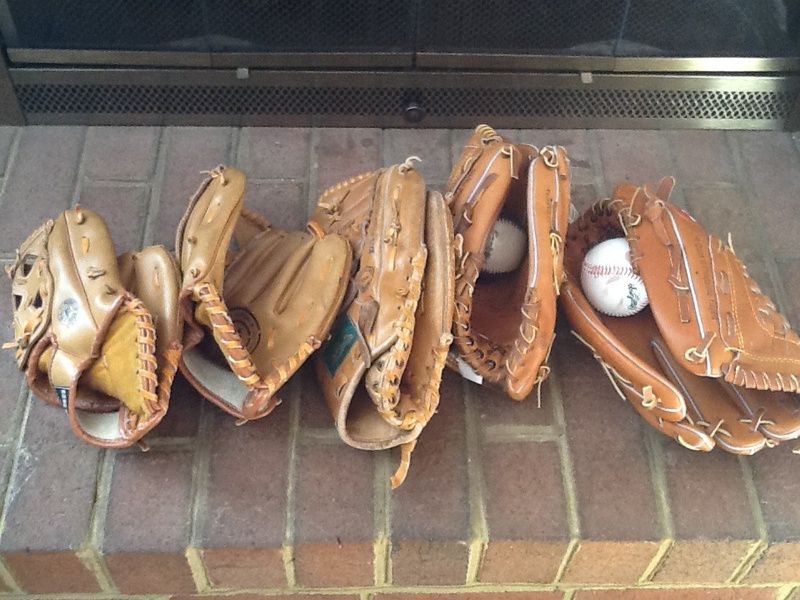 Before we left for Monday’s game, my husband asked me if I knew where our old baseball gloves were. He wanted to bring his glove in case a foul ball came our way. I remembered seeing them high on a shelf in one of the guest bedroom closets. I pulled them all down and lined them up. What memories they brought back! We had bought one for each of the kids as well as ourselves, and we used to play catch out in the backyard. I remember how cute the children looked in their baseball caps. It was a heart tug, for sure. I miss those days of baseball games and hotdogs at St. Mary’s as a family. Going to Harbor Park on Memorial Day reminded me of those times. I even ate an extra hot dog for those kids. 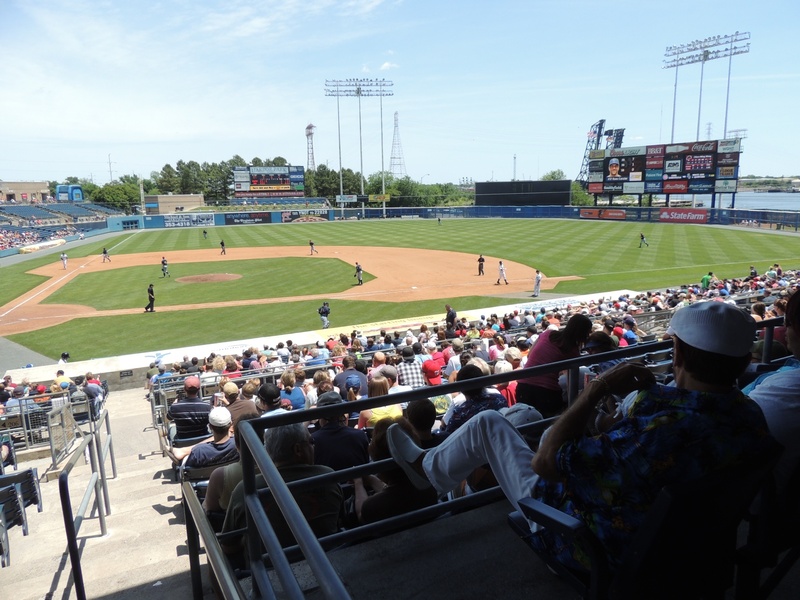 This entry was posted in Favorite posts, Just Blogging and tagged baseball, children, family, Hampton Roads, life, memories, minor league baseball, Norfolk Tides, nostalgia, personal, Sports. Bookmark the permalink. Your post brought back memories for me too. I played girls fastball through high school, and we have been to many community and minor league games. But this past winter we went to a Cactus league spring training game in Phoenix. We had no idea that 11,000 other people would be there. It was the bottom of the first before we even got our car parked! Girls fast ball, Margie? Good for you. I was the geeky kid during gym class who would run the other way if the ball came anywhere near her. Needless to say, I was the last person picked for a team. I used to watch slow-pitch softball and loved it. I so remember those baseball games – the singing, the popcorn, the crowds cheering and yes, the hotdogs. I think it was the only time I ever ate hotdogs! And I think you even enjoyed those hotdogs, Ems. Makes me happy to know you think back fondly on this times. I went to my first baseball game as an adult after I moved to Maine. We love our Portland Seadogs!! They are a seed team for the Boston Red Sox. I too love the hometown flavor and the fun family atmosphere at the games. I usually go every summer. The beer is colder, the hot dogs are yummier and the peanuts the best at the ole ball game!! You are so right, Carol! Well said! “TIme stands still with baseball” sums up my thoughts on the game. I like fast action sports. I think it’s cool that each of you had your own glove. You aren’t alone, I see from the comments, Patti. I guess you either love baseball or you don’t like it much at all. I don’t enjoy watching it much on TV, but I love going to the game. Loved the gloves. I am going to my second baseball game ever this week. I don’t understand baseball and I think it’s boring, but I’m going with my family who all like baseball, so maybe it won’t be too bad. Lisa (comment above) has the same opinion I do – seems slow and dull. And just when it seems like something is starting to happen, they all go sit down and the other team comes out. My parents used to take us to the local baseball games too and the memories are sweet. Now my brother lives in San Deigo and goes to every single Padres game. A lovely post that reminds of us of hot dogs and peanuts and the American spirit at the old ball game. Thanks, Dor. Nothing like rooting for the home team! My son-in-law joins the local team and plays baseball every weekend. Good for him, Amy. You are never too old for baseball. We Canadians love baseball, too! I really miss going to my son’s games (he never played beyond a basic city softball leaque, but attending his games was a wonderful twice-weekly tradition for ten summers. We took in a couple of games at the Skydome (or Rogers Centre, or whatever they call the big baseball diamond in Toronto these days) and it was interesting to watch the pros play, but not nearly as much fun as rooting for my son and his team. Of course you do, Margo! Forgot about my Canadian brothers and sisters! I agree…there is nothing like watching your kids play sports. More fun than pro sports any day. I’m laughing so hard now. The melamine trays made the garage sale, but certainly not these. How did that garage sale go, btw? Okay, so call me a sentimental fool, Georgette. The garage sale only netted $33, a fraction of what my greedy little hands had projected they would be counting. And the TV trays? Didn’t sell. Imagine that! LOL without my glasses on I thought the gloves were hot dogs 🙂 There isn’t much baseball here. I’d love to see a game though I’m not a huge sports fan. It’s the atmosphere that’s appealing. Your comment cracked me up, Alan. Keep those glasses on! I totally agree that it is the atmosphere that is appealing. And the food…nothing like a hotdog at a baseball game. Sneaking in a reply here to your comment inquiring about Tangier. Yes, we have been to Tangier – we took the ferry out of Reedville. Going over was very ROUGH! But on the return trip, the water was like glass. There’s not much on Tangier: we took a golf cart tour, which was nice. There are a couple of restaurants and your typical souvenir shops. We don’t plan to return, (once is enough) but it’s nice to say you’ve been there! Glad to get your opinion, Dianna. It answered my question perfectly. We were thinking we didn’t need to plan a trip there, and now I know we are right! You need to ge up early to get to Reedville by 10 .am. for the cruise ship to take you to this tiny, beautiful island in the middle of the Chesapeake Bay. But it is well worth the trip to eat there and experience this enclave of watermen who still speak a dialect that can be traced to the first English settlers. I think I trust your judgment more, Dianna. We’re going to pass on Tangier Island. The fact that you wouldn’t go back said it all for us. Yes, Mama, I just saw your picture and left a comment. How funny! Love the picture of the gloves, Susan. It brought back memories for me too :-). Playing catch is so universal, Stacia. Would love to play catch with my kids again, but I don’t think those gloves will fit them anymore! Funny, we went to a game just last night. They got smoked 5-1. But you are right, a very enjoyable way to spend a summer evening. And the light rail is very handy. I don’t have my glove anymore but I caught 5 foul balls bare-handed. OK, maybe it was just four…..
George will be so jealous, Al! At least the Tides got a run when you saw them, it was 8 zip when we went! I’ve never been to a baseball game (other than high school). But I used to love to watch it on TV. Seeing those baseball gloves had to bring back such sweet memories! Too bad the Tides are so far from you, Dianna. I think you’d enjoy a game. We used to take our kids to Houston, too, to see the Astros play. I agree there’s something very “American” about the setting, especially at a minors game. I still can’t get into the sport. Seems so slow and dull. The slowness is one of the things I love about it, Lisa. Time to talk to each other, time to go back and back and back for food. No one’s in a rush. Great way to spend a lazy afternoon or a summer night.